Are you having RV refrigerator cooling performance issues? Here we try to offer our RV refrigerator best practices and demonstrate the cooling performance of a Norcold 1210 RV refrigerator. We had the chance to work on a fridge and baby-sit it for a day after the work was done. We installed several data loggers to record the performance. 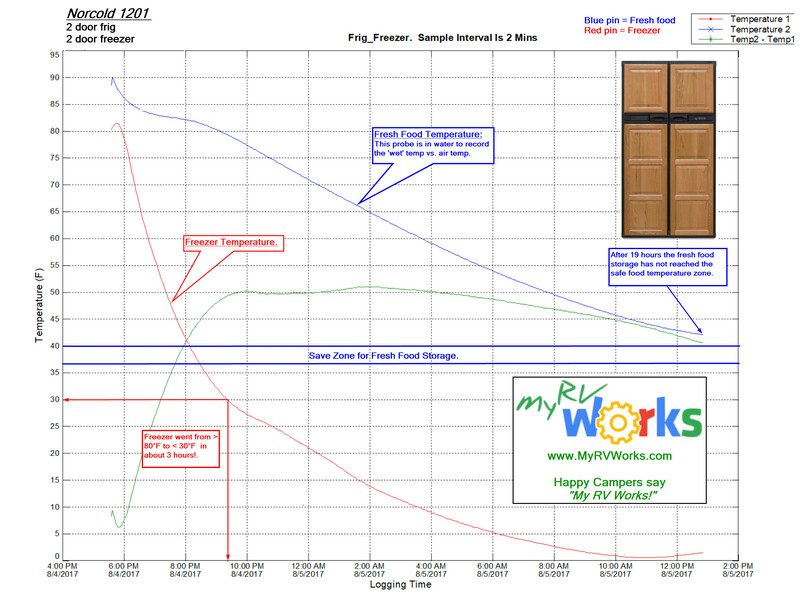 I took one of the logs and marked it up to help folks ‘see’ the temperature performance of a Norcold 1210 2-door refrigerator from ambient temp above 80 degrees down to safe food temp range. The freezer got below 32 degrees within 3 hours but the fresh food compartment was still not there after 19 hours of continuous operation. This ‘test’ frig was empty when these tests were performed. Adding food will certainly affect the performance of any refrigerator. It is also important to note that these RV evaporation refrigerators have no moving parts and work on convection and heat absorption through the fins in the frig and back wall of the freezer to keep your food cold. Food packed too tightly in the fresh food compartment will prevent the convective air currents to flow through the shelves to the fins where all the heat absorption happens. Also, it is important to not add anything that is too warm, even room temperature, to the refrigerator. Doing this will increase the temperature of the entire fresh food compartment and may take hours for all this heat to be ‘absorbed’ through the fins. Opening the refrigerator door for 1 minute will take 1 hour for the frig to recover back to its safe food temp range so keep the door closed as much as possible! If you are having any refrigerator performance issues with your RV refrigerator contact a factory trained RV tech to diagnose the issue and keep your food safe! Happy campers say “My RV Works!” and we are here to help you enjoy your RV and stay healthy and happy while you enjoy your RV investment.